1. There are cracks and potholes. Cracks are inevitable in pavement, but they can be fixed as the wear and tear starts to present itself. The environment (e.g. the sun, moisture, or movement) plays a key role in creating these cracks. 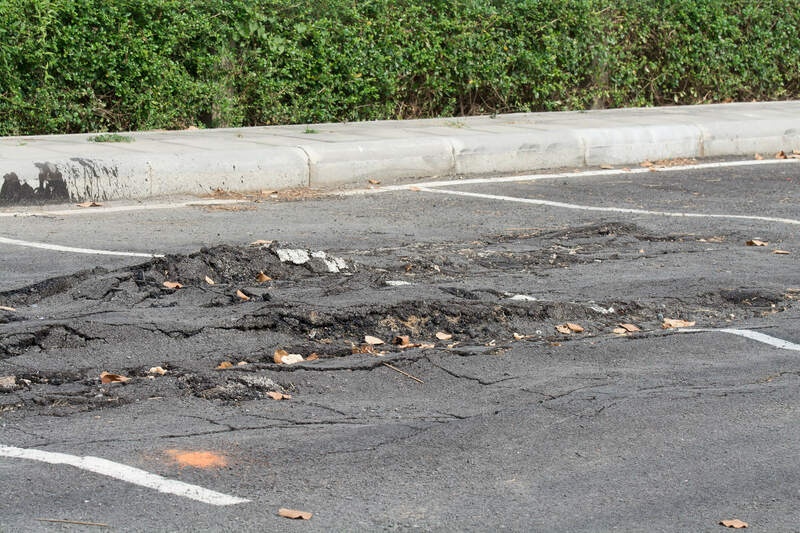 If there is extensive damage on your parking lot’s surface, then this can easily increase maintenance and repair costs. It is important to act when you start to see these cracks form, as they can worsen over time and turn into potholes. 2. Your parking lot has an abundance of oil spots. There is no stopping oil from building up and creating spots, as cars will naturally drip oil when parked in your lot. Oil reacts with asphalt in a way that degrades its strength over time, causing cracks and potholes to form. Parking lot seal coating prevents weather damage and resists oil to keep pavement strong over a longer period of time. 3. There is noticeable warping and raveling. Have you noticed warped areas of your parking lot slowly building up over time? Typically caused by faulty foundation or heavy vehicles, warping immediately creates an unsafe space for drivers and pedestrians. Warped areas can cause damage to cars and harm to pedestrians. If someone trips over one of these spots in your parking lot and sustains an injury, then you may be impacted by a lawsuit. Warping can also be easily detected when it rains. It is time to repave your parking lot if your pavement is starting to house puddles. The important updates you make in your parking lot not only have to do with safety, but also have to do with the driver’s experience. Raveling is another indication that it is time to give your parking the attention it needs. Asphalt raveling results in loose stones and debris accumulating on pavement, creating another danger for drivers in your parking lot. Raveling makes it harder for a vehicle to grip the road and can make hydroplaning much easier. Paving and sealing your lot are crucial to keeping it safe and clean. To avoid higher maintenance and repair costs, it is pivotal to address these issues as soon as possible. 4. Lines and colors are fading. When the lines in your parking lot are fading, it becomes difficult for drivers to discern directional arrows, parking stalls, and other important markings in your lot. The environment also has an impact on this, which means sticking to a general maintenance schedule is key to keeping your lot always looking its best. Though sealing your parking lot can stall the effects of the sun’s UV rays, colors will still fade over time, including the asphalt itself. Do you need paving, general maintenance, and excellent customer service to give your parking lot the upgrade it deserves? Contact Curcio Enterprises, Inc. to keep your parking lot running smoothly year-round. We are a dependable, licensed, and insurance business that has been serving the parking industry since 1975.